41st version of largest outdoor high school meet in the US. 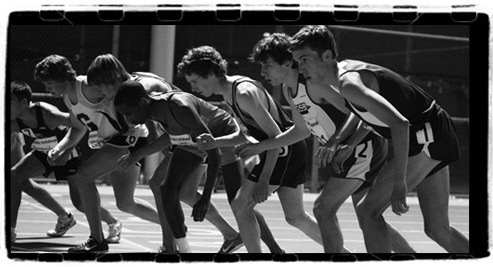 Late in any serious distance race, every lap becomes a choice. Every sweeping turn and telescoping straightaway contains a difficult decision. Push on through the pain or ease up and settle in? Ignore the fire in your chest and the fire in your legs and the doubt welling up in your mind, or concede that maybe nothing you’ve done has actually prepared you for this moment? That you are experiencing a sort of pain that exists outside the preparations you’ve undertaken. A pain that doesn’t care about the numbers in your training log or the miles on your shoes. A new kind of hurt, something primitive and opaque and tidal. A discomfort that crashes over you in waves, blinding and white, leaving every cell in your corpus screaming for oxygen. Every corner of your body begging for air that your lungs are incapable of delivering. Things you’ve only read about in Biology class are begging for air—mitochondria and golgi apparatus and nuclei by the millions. All needing oxygen. Continue this act of self-immolation, fanning the flames in your legs and lungs, or break stride and cruise for home. Last Saturday night, in the inaugural 5000-meter race at the Arcadia Invitational, Chris Derrick of Neuqua Valley High School in Illinois had a choice. He chose—lap after lap—to keep setting himself on fire. There was no reason, from a competitive perspective, to turn the ratchet any further. The rest of the field was dismantled, a distant memory which had slipped away soon after the opening mile. The crowd was content and cooling off, sated already by a full day of track and field talent. The inside lane was devolving into a traffic jam of lapped runners. A win and an impressive time were all but guaranteed; there was every excuse to dial back the pace and phone in the last five laps. But Chris Derrick kept pressing, kept clipping off 67- and 68-second splits, metronomic in his efficiency, stolid in his focus. Grinding it out. Seeing this thing through to the end. As they rose and responded to his effort with full-throated support, the grandstand masses seemed to understand the rarity of what they were witnessing. The meet announcer only whipped them into a further frenzy. The enthusiasm came, not just in recognition of the splits Derrick was hitting, or the magic time he was approaching, but of his dogged pursuit of something as ephemeral as the fleeting second. It was, on face value, a remarkably banal undertaking—a series of arrested falls played out over three miles on a congested, repetitious oval. There should have been nothing captivating about it, but there was. Because this isn’t how our world usually works. We live in a time of measured circumspection, easy answers and prepared excuses. Shortcuts and hyped-up “sure things.” Instant gratification and legal representation and chemical supplementation. Athletes, professional and otherwise, who lick a finger and consider the wind before plowing into the brink. How refreshing, then, to witness a young distance runner at the height of his ability step to the track without hesitation or guile, seeking only the best that his body and the competition might provide. Looking for a challenge, a good hard race, a gut check. Knowing how easy it would have been, once the balance of the field was relegated to the rearview mirror, to ease up on the pedal. Let the 67’s slip to 68’s. The 68’s to 69’s. 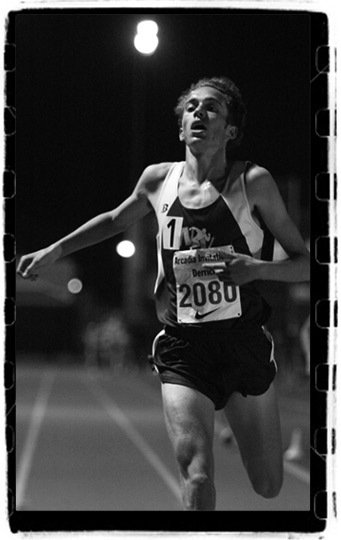 Let this crazy dream of a sub-14 5k in a high school race fade into the cool California night. Who, if anyone, would hold it against him? Who would begrudge him a 14:10 or even a 14:15? But as he cut through the descending coastal darkness, he also had to know that the atmosphere was as close to perfect as he may ever get. The crowd was into it. The meet announcer was into it. The evening was cool and still and humming with electricity. How often does a chance like this come down the pike? How often are you young and fit and fast and ready? There was something in that last comment, and his overall demeanor, which stood out in the crush of attention after the race. A quality as uncommon these days as the time he committed to the track or the place he carved out in prep running history. There was a sense of indebtedness to the people who had bothered to come out and watch him run. Feeling like you owe the crowd your best effort? 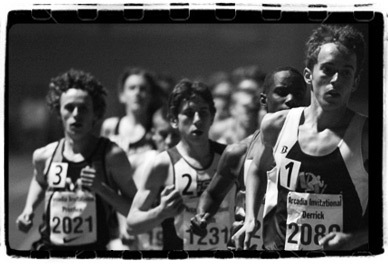 Acknowledging the unspoken pact between athlete and audience, a commitment that if one side is willing to scream itself hoarse, if they are amenable to urging a lanky, tousle-haired harrier on through the gathering the darkness, then that lanky harrier will deposit every last ounce of effort on the track. He will lurch if they will lift him. He will go to the wall for the masses. He will see this thing through. He managed a riveting final lap of 60 seconds and stopped the clock at 13:55.96, the fastest high school-only time in US prep history, by a wide margin. A time which ranks him #6 on the all-time high school 5000 meter list. An April mark achieved before Tax Day, without benefit of pacemaker or professional. Just a seventeen year-old boy against the watch, with a crowd to carry him. In the moments after the race was run, even before he’d had a chance to pull on his sweats, even as reporters fumbled with their voice recorders and spiral notepads, even as a small cadre of Arcadia students began assembling for autographs, Chris Derrick seemed somewhat overwhelmed by the enormity of what he’d just accomplished. And he was only talking about the race.